1964, USA---Food Stamp Act (SNAP). In the United States, food dates are NOT required by federal law, with the exception of baby food. A survey of newspaper/magazine articles reveals concerns about product dating (shelf-life, open dating, sell-by, best-if-used-by, use before, freshness dating, pack date, expiration date, quality assurance date, pull date, calendar date) in America began in the 1950s. State, industry, and manufacturer's dating practices varied according to location and product. In the 1970s the "Consumers Right to Know Act" touched on product dating. In the late 1980s the media gain raised consumer awareness and, by association, confusion, over the plethora of extant dating systems. In sum: shelf-life dates were added to different foods at different times and mean different things in different industries. Today? They are as confusing as they were 40 years ago. "In 1971, at the age of 65, Mrs. [Esther] Peterson started another career, this time in business as vice president for consumer affairs at Giant Food Inc., the largest supermarket chain in the Washington-Baltimore area. Odonna Mathews, who worked with Mrs. Peterson as a University of Maryland undergraduate intern and now holds Mrs. Peterson's old position at Giant, said: ''Her friends in consumer activism asked, 'How can you work for a business and represent the consumer?' She showed it could be done.'' At Giant, Ms. Mathews said, she worked with Mrs. Peterson on the grade labeling of food. ''She found it confusing,'' Ms. Mathews said. ''She asked, 'What's the difference between U.S. Fancy No. 1 and Extra Fancy?' '' Ms. Mathews said Mrs. Peterson persuaded the supermarket to disclose what seafood had been previously frozen, a widespread practice now but one not in use before then. ''She got Giant to try nutritional labeling on its private products before it was required by Federal law, comparing calories and proteins,'' Ms. Mathews said. ''She got Giant to use open dating -- putting a date by which products like yogurt or milk must be sold.'' Before then, the stores used letter and number combinations to express the dates, a code that was not clear to buyers." "A bill requiring open dating has 'better prospects' than in the two previous legislative sessions when he introduced similar bills, according to State Sen. Anthony C. Beilenson (D-Los Angeles), and the bill is winning support from a new group--consumers...In previous years his open dating bills were killed in the Agricultural Committee...Mrs. Shirley Doldinger, president of the Assn. of California Consumers for Los Angeles and Orange Counties, said her association is supporting the bill. But in her opinion, voluntary open dating by the food industry is preferable. 'I can't see why industry will advertise that their products are fresh and high quality without going the full route and giving the shopper the complete information on the label...If industry denies the consumer this information the consumer becomes suspicious. '...Following a shopping tour of five markets to check date information, Mrs. Goldinger found some reason to distrust dating practices. First, she found several packages long past the date still in market refrigerators. ...'Of course we don't know for for sure if these are pull dates or pack dates. "...The California Rural Legal Assistance lawyers filed a suit in San Francisco last December asking for a court order to require certain dairy companies to open date their produtcs...'Open dating has been the practice in Scandinavia for years without much trouble...We've talked with Richard Ralphs after Ralphs markets began to open date their products, and he said they had no problem, that buyers just had to be more careful about ordering milk. Valley Gold (a dairy company) has been calendar dating since 1956." "If the only milk left on the supermarket shelf has today's date on it, then does that mean the milk will spoil by tomorrow? And why does the dates on dry cereal follwo the phrase, 'best if used by' but there is no such phrase, only a date, on cottage cheese? Well simply becasue dates on different food products mean different things. The 'Jan. 20, 1979' stamped on a carton of milk does not indicate the same thing as thtaa date on a package of yeast or a box of cereal. But in each case, the aim of the open-dating is to reveal the freshness of the product. Who determines the date? Not the federal government, as many shoppers assume, but usually the manufacturer, retailer, or an association of producers for a specific product. Open-dating is voluntary under federal law, and only meat, poultry, and milk come under any type of ruling. There area four types of open-dating in common use: the pull date, quality assurance date, pack date, and expiration date. Having all these dates seems to have only added to consuers' confusion since the open-dating system began. In fact, the recent food labeling hearings by the federal Food and Drug dwelled on open-dating to a deree. As one FDA spokesman said, 'the dates mean so many different things, they end up not meaning a thing. '...Pull date--this indicates the last recommended day for sale in a retail outlet. This date is set by the manufacturer or retailer to allow for sufficient home storage or use. This date is most often found on dairy products (milk, cottage cheese...and fresh meat)... Deli foods such as lunchmeats and sausage may also come with dating...'Fresh products such as pork sausage hae a 'sell by' date. After that the retailer must remove it from the shelf.' Quality assurance daate--Sometimes called 'best if used by' date. This indicates the last day at which that food item is considered at peak quality. Dry cereals, for example, are labeled as such...Expiration date--Indicaataes the last date on which the product should be used for assured quality...Pack date--Indicates the day on which the food was processed or packaged. This simply is another indicataion of how fresh the merchandise is and can be found mostly on canned foods...As with all dates, they are merel freshness indicators. Following storage guidelines for individual food times is the best way to insure freshness." "While the simple shelf-life dating of food may increase consumer confidence in the quality of the product, it may have little bearing on the food's safety. This conclusion was one of the major findings of the Congressional Office of Technology Assessment in a report made public yesterday following an investigation into shelf-life dating. The investigation sought to test the widespread belief that replacing the food industry's present system of largely indecipherable coded dates with clearly understandable open dates on food packages would help increase consumer confidence in food freshness, and encourage better handling of food products by retailers. 'There is little evidence to support or to negate the contention that there is a direct relationship between open shelf-life dating and the actual freshness of food products when they are sold,'...Open shelf-life dating involves putting dates on food packages to tell retailers and consumers when the contents should best be sold or eaten to insure freshness, The dates may say when the product was packaged, when it should be sold and the date that it should be discarded if uneaten. Some form of open dating, generally involving dairy products, now is in effect in 21 states and the District of Columbia. Some food processors also have put open dates on selected food products, including numerical or color codes to aid in inventory control. But the report said there was considerable confusion because of the lack of a uniform dating system. The present systems vary widely as to the foods to be dated, the dates to be used and their meaning...The report which was preapared at the request of the Senate Committee on Commerce, Science and Transportation, said 'There are no nationwide statistics on the amount of food sold that is not fresh'...According to the report, New York is one of those states that have no dating system at all. New Jersey requires the open dating of dairy productcs and Connecticut orders the open dating of milk. As to other overall findings, the report found that: Pressure for open dating stems from public perceptions that this would insure food freshness, which may not be abolutely correct. Open dating fails to take into account the influence of such environmental factors as temperature, humidity and light and is unlikely to 'in the near furture. '...The costs of open dating are small and unclear 'but nonetheless may add from 1 to 1 cent to the costs of each packaged food.'" "Although freshness dates are used by many shoppers when buying food, they actually tell very little about a product's shelf life, says Lloyd Witter, food science professor at the University of Illinois. Shelf life varies with the age and type of ingredients used, the process, the package, the environmental conditions during distribution and storage as well as the consumer's preference as to how fresh is "fresh." The food processor has control over those conditions until the packages are shipped from the plant or warehouse. After that, the responsibility shifts to the wholesaler, retailer and the consumer, Witter says. Many food packages already indicate in code the date they were processed to help supermarket personnel rotate stock and to identify defective merchandise in the event of a product recall. Witter says the issue of food dating has been debated for 30 years. Consumers have urged that actual dates be used to indicate a product's freshness. The types of dating systems that have been proposed are the pack date, sell-by date or best-if-used by date. "It's nice to know how long a food product will last but this is difficult to determine," Witter says. For this reason he thinks the best dating system would be the "best-if-used-by" date. This indicates that the food is still safe although possibly of lower quality after that time. According to Witter, the use-by date incorrectly implies that the product is of high quality until that date regardless of any storage problems and that it becomes unpalatable or dangerous after that date.The pack date tells when food was packed and leaves it up to the consumer to decide how long after that date the food is still of high quality. This is the coded date most often used for stock rotation. Many states now require a sell-by date, also called the pull date, on certain foods. After this date, the store manager must remove the package from his regular retail shelves and either dispose of it or sell it at a reduced price in a segregated part of the store. Food dating can be misleading and cause unnecessary problems in some cases, Witter says. Dating information depends on whether the food is perishable, semi- perishable or shelf stable, Witter says. Milk, eggs and fish are classified as perishable, and most states limit the length of time they may remain on shelves or in coolers. Requirements vary among states, however, and the actual temperature in a given cooler or the length of time the food is left outside the cooler will determine whether the product actually retains its high quality for the stated time. Similar considerations also apply to semiperishable foods such as cheese, cured meats, some pickled foods and snack foods. Even shelf stable food, such as canned goods, dried foods and breakfast cereals, can lose their quality if exposed to high temperatures and humidity, especially if their protective packaging is damaged." "Once upon a time, it was easy to get fresh bread. You could just walk to the local bakery and choose a new-baked, fragrant loaf. Today, if you shop in a large market, you probably do a lot more reading than sniffing to judge the freshness of bread--and many other foods as well. Along with the ingredients list, nutrition labeling and other product information, you may find any of six kinds of dates on food packages. Open dating, as this is called, got started in the 1970s as part of the consumers' "right to know" movement. Designed to inform shoppers of product shelf life and to guide retailers in stock rotation, it can be confusing. Some state and local statutes may require dating of perishable items such as eggs, milk and prepared sandwiches, but this country has no federal regulations and no uniform dating system. The hodgepodge of codes can befuddle any shopper. Open dating is not the only kind of numbering system manufacturers may employ. It differs from code dating, a series of numbers and/or letters used for inventory control. Nor is it the same as the Universal Product Code, the small block of parallel lines and numbers found on practically all labels. Instead, open dating is a specific date either printed, stamped or embossed on a product. Whether on the tops or bottoms of cans, on bottle caps or on the side panels of boxes, open dating is there to help shoppers select products at the store and keep tabs on them at home. The pack date--the day the food was manufactured or processed--tells how old the food is when you buy it. It is generally used on items with a long shelf life: canned goods, cake mixes and oils. Pack-date information does not tell you how long a product is good or safe to eat, but it is helpful for recalls. By contrast, the pull date or "sell by" date is the last day a retailer should sell a product as fresh. Perishable foods--dairy products, meats, fish, bakery goods and cold cuts--may be stamped with a pull date. It allows time for home storage, so that an item remains fine beyond that date. How long it can be stored at home depends to some extent on the food in question. Another category, the "best-if-used-by" date, may appear on cereals, aseptic packages of fruit and vegetable juices, snack foods, peanut butter, salad dressings and cookies. Items consumed after this date may represent no health risk, but manufacturers will no longer guarantee their quality. Occasionally, perishable goods like soft cheeses may be stamped with a "best-if-purchased-by" date, which is then synonymous with the pull or "sell by" date. Fresh meat packed at the store may have a "display date" to indicate the day it went on the food-store shelf. Expiration dates may appear on a few items like baby formula and yeast as the last date the item should be eaten or used. Although it is easy to agree that we ought to have shelf-life dating for foods, designing a simplified and more consistent system is a major hurdle. Shelf life depends on the initial quality of the food and its subsequent handling and storage. Most foods need to be protected from heat, light and excess moisture. In general, the higher the temperature during storage, the greater loss of food quality. Predictions of shelf life, then, are relative estimates that assume a reasonable amount of care in food handling. Even the freshest of poultry can quickly deteriorate if left for long at a warm temperature. A pack date on wrapped chicken can help indicate freshness, but such information is valuable only if appropriate food practices are followed, both in the supermarket and at home. Different kinds of foods lend themselves to different types of open dating. Some, like salt and sugar, have indefinite shelf lives and need no dating. They are not readily susceptible to microbial or chemical degradation if kept dry. Other foods are difficult to date because shelf life may depend greatly on how the product is stored. A "sell by" date on frozen fruits and vegetables would be impractical because most degradation occurs after they leave the supermarket freezer. The most desirable label for these foods is probably a "best-if-used-by" date that includes storage and handling instructions. In short, the dates on foods mean different things from one item to another, and it can be hard to decipher these numerous designations. Until a better system is invented, one way to help maintain peak quality at the table is to try to buy only as much as you are likely to use up well within the limits of freshness dating. The large economy size that lasts far beyond its shelf life is hardly a bargain." "Recent concern over a "PrimeTime Live" segment and other television investigations of some supermarkets has raised questions about the meaning of dates on food packages. "Sell-by," "use-by," "expiration" and "pack" are references to dates a consumer might find on supermarket products. And, then again, might not find. According to the U.S. Department of Agriculture, if a product is so stamped, here's what the designations mean: - Sell-by date is the last day the product should be sold. - Use-by date is the last top-eating-quality day. - Expiration date is the last day the food should be eaten or used. - Pack date is the date that lets the consumer know when the product was processed. But the two main regulatory food agencies-the Department of Agriculture and the Food and Drug Administration-have no ruling on mandatory dating of food packages, leaving it up to the manufacturer and packager whether to advise consumers on the window of use for their product." "Except for infant formula and some baby food (see below), product dating is not required by Federal regulations. However, if a calendar date is used, it must express both the month and day of the month (and the year, in the case of shelf-stable and frozen products). If a calendar date is shown, immediately adjacent to the date must be a phrase explaining the meaning of that date such as "sell by" or "use before." There is no uniform or universally accepted system used for food dating in the United States. Although dating of some foods is required by more than 20 states, there are areas of the country where much of the food supply has some type of open date and other areas where almost no food is dated." Long before we had modern medicine and nutrition science, people understood the relationship between what they ate and how their bodies reacted. Ancient Greeks and Renaissance Europeans "prescribed" foods based on humoral theory. Pre-industrial cookbooks typically offered "invalid" recipes. 19th century technology launched a brand new academic field called Home Economics. Educated Domestic Scientists and passionate health advocates fueled the temperance movement. A new genre of culinary literature was introduced. Home economics textbooks and healthy diet cookbooks were promoted as modern alternatives to "your grandmother's cookbook." In the 1960s gluten free cook books surface. Industrial-age American health advocates focused on the evils of adulterated foods and overeating. Several incorporate a fitness component. The twelve books featured below offer thoughtful starting points for exploring the range of ideas espoused in the USA in recent times. What do all of these authors/books have in common? A serious concern for improving the human condition and conviction his/her solution is the best plan. If you are interested in recipes from any of these period/popular books we are happy to share. ...Advocating high fiber and nut proteins, this cookbook and its ideas were avante-guarde in their day. Primary focus was consuming healthy (non-aduterated) foods. Appendix (p. 474-484) is copied from the Battle Creek Sanitarium Diet List, offering calories per ounce broken down by proteids, fats, and carbohydrates for dozens of common food items. ...Raw foodist movement proposed foods, when grown to maturity, were ready for use. "They are perfect, they are not raw, they are done; and when they are cooked they are undone." (p. 35-36). Introductory chapters "As a Remedy," "Emancipation of Women," "Selection of Foods," and "Feeding Children" offer critical glimpses motivating this particular diet. This book advocates eating raw meat and raw eggs. It advocates cereal products for fiber; it also offers a recipe for "Unfired Bread" (p. 165) and "Unleavenend Gems" instructing the cook to "bake quickly." (p. 165-166). ...This vegetarian cookbook was published "For the Preparation of Non-Flesh Foods in Palatable and Attractive Ways." In this book "True Meats" are nuts (peanuts, pine nuts, almonds), cocoanut milk, lentils/beans, and eggs. Trumese and Nutmese dishes are composed with commercially prepared ground nut products. There is an entire chapter devoted to mushrooms which would be perfectly acceptable in today's restaurants, vegetarian or not. Egg-free dishes are also offered for parochial vegetarians. Coffee, tea & hot chocolate are classed as unhealthy. Suggested beverages are fruit nectars, lemonades, cranberry juice and bran tea. The Nature Cure Cook Book and ABC of Natural Dietetics/Mrs. Anna Lindlahr and Henry Lindlahr, M.D. ...Vegetarian cook book based on the dietetics originated at the German School of Nature Cure. This book begins by dismissing contemporary competing vegetarian cookbooks as uninformed. Recipes in this book are annotated to show their food elements (St. starches; S. sugar; F. fat; P. proteids, M. minerals). The authors recommend uncooked foods: "Nature did not create man with a cookstove by his side." (p. 11) but does not prohibit cooking: "Peppers a la Creole" are baked for a half hour (p. 178). ...Author Oppenheimer's preface tells her readers she is a diabetic who has sampled treatments at Carlsbad and Neuenahr. She notes..."Little has been done for the general public in this country in preparing special recipes for the diabetic, and in working out their food values. Inasmuch as each person's carbohydrate tolerance is different, it is absolutely essential that the carbohydrate content of each recipe be known; only then can it be safely used." (p. v). Ms. Oppenheimer's goal is to help caregiver/cooks understand what diabetes is & give them everything they they need to know to compose diabetic-friendly meals. We home cooks confronted with adjusting family meals to meet this particular challenge "get it." ...This movement launched in 1899 in "a world in which many foolish and artificial conceptions of life were prevalent. These ideas were a mixture of old superstitions and half baked-conceptions of new-born science...The catastrophe of the World War has...done much to awaken people to a practical realization of the physical foundation of life...Health has become popular; a strong and beautiful body has become a thing of honor and glory..." (p. iii-iv). MacFadden comments on the positive aspects of nut/fruit, raw/natural, and vegetarian regimens. He advocates careful mastication (chewing), drinking water (hydration) and healthy cooking to unfold natural flavor (steaming vs boiling). ...Introducing the concept of "Super Foods," this ambitious holistic dietary text fed the timeless table of social concerns. Chapters titled "Overcoming Faulty Elimination...The newer way to internal cleanliness," "Eat and Become Slender," "Goodbye to That Tired Feeling: Fighting fatigue with diet," "Beauty is as Beauty Eats: Specific foods for the skin, hair, eyes, and teeth" and "Live longer, Look Younger." This book's preface was penned in Beverly Hills, California. Makes perfect sense in context. ...Cookbook offering recipes from Alfalfa to Watercress Juice. 'How much juice can be take safely?...As a general rule one pint daily is the least that will show any perceptible results and preferably from two to eight pints of more." (p. 11). How to make your home juice? This book promotes electric Triturator and Hydraulic Press Home Juicers. Original book was published in 1936, revised enlarged edition 1947. ...Mr. LaLanne was a body builder, fitness crusader, and popular TV fitness show host in the 1960s. This book not a cookbook but a holistic approach to eating and fitness based on making healthy choices. To Mr. LaLanne, truly glamorous people are healthy and vibrant. Detailed discussions of the properties of common foods (chicken, bananas, potatoes, eggs etc.) and general notes on cooking styles are offered. The solo recipe in this book is for party popcorn balls (p. 230). ...Weight Watchers began in 1963. The original cookbook was published in 1966. Our revised edition incorporates the latest changes. This plan's success was based on a scientific Menu Plans calculated to reduce calories while permitting followers enjoy familiar foods. In this book, "dietetic" products are not permitted except artifical sweeteners, carbonated beverages and imitation butter products. Baked lasagne, enchiladas, and chicken tetrazzini prepared from this book are okay. This cook book offers two options: the new "Leveling Plan" and the "Maintenance Plan." The book's primary purpose is to offer "legal" recipes. ...Popular TV fitness show host, Mr. Simmons promoted the "Live-It" food program. Best known for his never-ending high energy level and aerobic excersizes, he advocated passionately against junk food and overeating. "How to tell if you're an overeater" and "The Painful but Very Honest Image Test" invite readers to examine their lifestyles in simple terms. The "Live-It" program offer 3 plans, based on the amount of weight the dieter targeted to lose. This book offers general guidelines for healthy eating choices and a tiny handful of recipes. ...Nutri/System launched in 1971. Like Weight Watchers, it opened a national chain of weight-loss centers and sold commercially prepared food. This company focused on low-calorie meal plans, behavioral and nutritional counsleing, and exercize. The Nutri/Syetem programs coatains a 1000-calorie meal plan. The "Flavor Set-Point Theory" was based on the premise that overweight people crave intensified flavor and varied texture. Recipes are noted for their calories, fat content, carbs, protein, sodium, cholesterol and calcium. Menus are based on an "Exchange" system. Fettuccini with Mushroom Stroganoff, Zucchini Parmesan, and Key Lime Pie okay. Special emphasis on exotic Asian, Middle Eastern and Indian cuisine. 300 Years of Kitchen Collectibles/Linda Campbell Franklin--5th ed. Cooking dishes from original historic recipes can be very challenging. Even if you're lucky enough to have access to ancient roasting pits, colonial beehive ovens, conestoga kitchens and fireless cookers. Most old recipes were not much more than shopping lists with cursory prep notes. Step-by-step instructions were omitted because it was understood the cook already knew the basics. After the cake was baked a "hot oven" to "light brown" it was "served forth" when it was "done." Before "standardized" measuring units, cooks used six different types of measures, each posing special challenges for today's recreating cooks. NOTE: They were not problems for the cooks back in the day, as they were familiar with the terms and measures. Baking is a relational science relying on consistent proportions and oven temperatures. It was not until the industrial revolution, when it became cheap to produce kitchenware and ovens had F. marks, that "standard" measures became popular. Promoted by heavyweight home economists (think: Fannie Farmer & Sara Tyson Rorer), they were embrace by "modern" cooks. Early 20th century cookbooks provided long lists helping cooks "translate" their old recipes into the new formulae. The same held true for oven temperatures (hot, very hot, slow, fast). Today we find remnants of the old measures in some recipes. Visual and tactile cues transcend time. Weight (a pound of flour) ...Considered the most accurate measure, even today. But? different grains/grinds had different weights; humidity also made flour heavier. Volume (cups, wineglasses, teaspoons, saltspoons, basters) ...Before standardization these could be any size. A cook relying on her own measuring devices could reproduce consistent results. Today's cooks trying to reproduce historic recipes are challenged by these measures because we don't know what size "grandma's" teacups were. Relational (butter the size of an egg) ...Modern cooks overthink this, mostly because we have different sizes of eggs in our supermarkets. Most eggs back in the day were small. Chickens were not fed industrial/chemical nutrient enhanced grain. Price (5 cents ammonia; a 10 cent can of tomatoes) ...If the recipe is dated, these amounts can be identified using food ads published in old newspapers. If it is undated, it's almost impossible because prices fluctuate according to supply, demand and season. Cook's experience (enough, until it feels like) ...Today's bread recipes still include this. You can measure your ingredients but when it comes to achieving the perfect bread dough you go by feel. Personal taste & larder variables (salt to taste, as you like it, if you have them) ...Spices, nuts, dried fruit, &c. can be incorporated a little or a lot. Local apples were used for pie. Baking powder came in different strengths (single, double acting). Weights & measurements are likewise time/country/food specific. Did you know some culinary historians say we Americans measure with objects (as opposed to weight) because of our pioneer heritage? Conestoga wagons had plenty of cups & spoons but very few reliable scales. Family recipes specifying "5 tins" of sugar are among the most challenging. The omission of flour measures is brilliant. Why? Prior to modern supermarket flour, this variable item created different products according to grain, grind, season, and storage. A good cook knew when the flour was enough by feel & texture. Measurements and detailed cooking instructions were a by-product of the Industrial Revolution and are commonly attributed to Fannie M. Farmer, principal of the Boston Cooking School. There is no single place to obtain all of the historic conversions necessary to redact (interpret & recreate) original historic receipts in your kitchen. This does not mean your task is impossible. Quite the contrary. ---maybe the salt used in ancient times was much more concentrated than today? Ask for help! Many living history museums have staff who specialize in foodways (recreating original recipes, cooking in old kitchens & cultivating heirloom gardens). The trick is to find the right person. Be sure to check the museum's description to get the right location and time period (Old Sturbridge Village recreates inland Massachusetts in 1830s) BEFORE you contact the foodways people. No matter how close you come to the original recipe the end-product will probably taste different from what people ate long ago. Even if you cook it in the *traditional* way. Why? Because the food we buy today is different from the food they used back then. Late 19th/early 20th century cookbooks provide the most reliable primary data for linking traditional amounts with modern measures. Home economists devoted themselves to interpreting and standardizing the old measures. Butter the "size of an egg" became 2 oz; butter the "size of a walnut" became 1 oz. Hot, quick, moderate & slow ovens were assigned farenheight temperatures. Imagine the challenge our foremothers faced trying to recalculate family favorites to accomodate new cooking technology. Can sizes likewise morphed. Anyone today know how much a WWII-era No. 2 1/2 sized can held (weight/volume)? Recipes specifying ingredients by price or size (5 cents worth of marshmallows; box of Jell-O, paper of cornstarch) or race of ginger are the most challenging of all. Context clues (Chicago 1893?) are gold. If you have a measure you can't decipher let us know. What amount was "5 cents worth of marshmallows?" Ingredient amounts expressed in cost are among the most difficult to identify because the answer depends upon year, place, and point of sale. Identifying quantifiable prices (weight, can size, volume) is key. "Marshmallows, 15 cents/package" does not provide enough data to interpret actual amount. "Pushing Marshmallows" 1919 describes various brands, packaging and price points. Our survey of historic USA newspapers confirms the phrase "5 cents worth of marshmallows" was popular from 1907-1924. Marshmallow recipes also used product counts (16 marshmallows). These amounts suggest marshmallows might have been sold in 5 cent packages (not found) or individually at confectionery shops (also not found). There are two ways to discover the exact amount of ingredients expressed by cost. Neither is exact. Both can come close. "Jack Frost Marshmallows...Pound (80 pieces) 25 cents." CONCLUSION: "5 cents worth" may be approximately 1/5-1/4 lb. 2. Find the same recipe in another source (magazine, cookbook, newspaper) in the same general time period, using different measurements. The problem with this method, of course, is that very similar recipes may support different proportions, according the the author. The recipes we found using this phrase produced cake filling and fruit-studded dessert creams. Mass-produced marshmallows were very popular in the early 20th century. What is a "race" of ginger? Our research indicates a "race" of ginger is a root, sometimes also called a hand. This indicates the fresh, raw root, not a mediated variation (ground ginger, ginger sticks, etc.). We do not find any notes regarding converting this for modern redactions (as in, how big was the 'average' ginger root in the 18th century?). Your best bet is to examine other ginger recipes in your original source for possible proportions. Modern tastes & recipes are not generally accurate guides for recreating historic flavors. Good luck! "A rase is a hand of ginger, from French Racine, meaning root." "A root (of ginger); = HAND n.1 21d. c1450 Med. Recipes (BL Add. 33996) in F. Heinrich Mittelengl. Medizinbuch (1896) 89 Rubbe e race of gyngyre on e wheston in to e wyn. a1500 in Englische Studien (1885) 8 283 Atte Modone..where groweth good Romeney and Rase. 1598 SHAKESPEARE Henry IV, Pt. 1 II. i. 24, I haue a gammon of bacon, and two razes of Ginger, to be delivered as far as Charing crosse. 1626 J. SMITH Accidence Young Sea-men 40 A few stewed Prunes, a race of greene ginger. 1655 E. TERRY Voy. E.-India 97 Ginger..the large Races whereof are there very excellently well preserved. 1705 Pastry-cook's Vade-mecum 47 For the pickle... Eight blades of mace, 3 razes of ginger, a Spoonful of whole Pepper, and one onion. 1711 Boston News-let. 5-12 Mar. 2/2 Alspice, Pepper, and Ginger Rase and Ground... To be Sold by Zabdiel Boylston, at his Shop at the Head of Dock-Square in Boston. c1825 Houlston Tracts II. xlvii. 8 A race of ginger you shall surely have. 1879 Cassell's Techn. Educator II. 91/2 The ginger of commerce is the dry, wrinkled rhizomes of the plant, which are called �races�. 1913 H. KEPHART in B. A. Botkin Treasury Southern Folklore (1949) IV. iii. 688 �Can I bring a race of ginger?� means the unground root. 1996 Observer 8 Dec. (Life Suppl.) 40/3, I notice that a hand of ginger is also known as a �race�." Why are some old recipes called "receipts?" According to the Oxford English Dictionary, the words "receipt" and "recipe" date in English print to the 15th century. The original meaning of both words was medical in nature. They derived from Latin and were used by physicians to head prescriptions. The abbreviation Rx derives from this. Up until the 20th century it was common practice to combine both formulae for food and medicine/home remedies in one book. "Recipe," meaning a "statement of ingredients and procedure necessary for the making or compounding of some preparation, esp. of a dish of cookery," dates in print to 1743. The similarity betweeen these two words is understandable since they both come from the same Latin word recipere (to take back or receive). Recipe is the present tense, imperative, meaning literally "Take!" From the earliest days of medicine, recipe has been used as the first word in prescriptions, either spelled out, or in recent times, abbreviated by the letter R with a slant mark across its base. Though recipe is still used primarily in this medical sense, it has also long been used to designate any list of ingredients, as in cooking recipes. Receipt comes from the past participle of recipere and originally meant "that which has been received," Since receipts are traditionally handed down from experienced to inexperienced cooks, these formulas are "received" by one from the other. Formerly receipt was used to indicate a list of medical ingredients as well as a table of ingredients for cooking, but in modern times it is used solely as a culinary term." The study of word usage is an inexact science. The first instance in print often lags years behind popular use. Conversely, print evidence often remains long after a word is falls into falls to disuse. Our survey of 18th and 19th century American cookbooks reveals the term "receipt" is routinely employed prior to the Civil War. Cook books published between 1870-1899 use both terms, although not in the same book. "Modern" books (those written by domestic scientists and home economists) appear to have preferred the term recipe. Indeed, these authors sought to distance themselves from the traditional practice of combining culinary dishes and home remedies. Diets for invalids became the object of scientific study and patented medicines replaced home remedies. Perhaps this explains the eventual acceptance of the word recipe in place of the "old fashioned" receipt. As the we march toward the 20th century we find the word receipt falling toward disuse. New York Public Library, Menu collection--searchable by dish or restaurant. ...food styling, cookbook writing, food history, restaurant reviewing &c.
University of the Pacific (California, San Francisco area, Ken Albala director) NEW! Some living history museums offer historic foodways/cooking classes to the public. Like fire, the microwave oven cookery was discovered by accident. Follow the fascinating journey from science lab to American home kitchens. 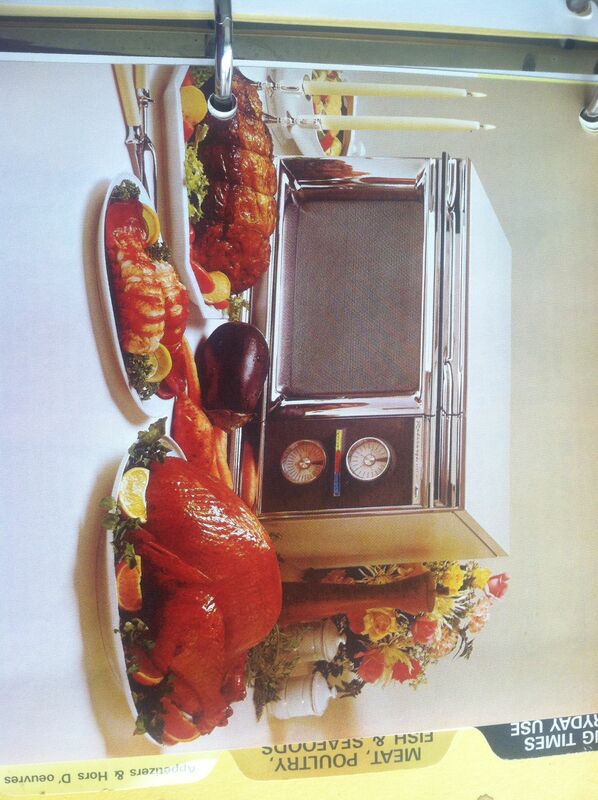 Innovative and trendy, microwave ovens were first purchased by well-off American home cooks in the 1960s. Twenty years later, they were the norm in average USA kitchens. We learned much, mostly from trial and error. Microwaved turkeys don't crisp up. Microwave popcorn...booya! "In 1942, a Raytheon inventor, Percy L. Spencer, noted that a chocolate bar melted in his pocket while he was testing a radar tube. The then cut a hole in a kettle, inserted an electron tube and by 1949 Raytheon patented its 'Radarrange." Designed for restaurants, the early 1953 models were oversized, cost about $3,000 and turned out bilious grey meat and limp french fries. They were duds for about a decade, remaining alien to many consumers. The Irish cook of Charles Adams, Raytheon's chairman who turned his kitchen into a proving ground, called the ovens 'black magic' and quit." "Radar, the war-time magic ear, now is ready to move into the kitchens of America in the form of electronics cooking. Cleveland newsmen were given a preview of the raytheon radarange by the Brandt Company, the first distributor of the revolutionary oven which prepares food in a fraction of a jiffy...a raytheon magnetron tube is the heart of the radarange. It is the same tube found in all radar sets. Since the cooking is done by radio frequency energy, the radarange has a band of frequencies between 2,400 and 2,500 megacycles, authorized by the federal communcations commission. Whereas radiant heating cooks from the surface inward, the radarange cooks all parts of the food simultaneously. The rapid cooking does not permit natural oils and flavoring to esacape. There is no grease, smoke or odors. The Brandt Company plans to lease the radarange to restaurants and hotel at first. But it probably won't be long before mother can wait until she hears father come in the door evenings, then she pops the food in the radarange and has it on the table ready to eat by the time her husband has his coat off." "A group of gourmets sampled the first radar-cooked dinner in American history here yesterday after watching a manufacturing company's food consultant whip up a banquet on a radar range in what must be record time. Eat and run advocates among the diners were well pleased not only with the food but by the fact cooking required only 3 minutes 45 seconds. Baked lobster needed 2 minutes 15 seconds. Broiled sirloin steak with bernaise sauce was prepared in 50 seconds. Grilled ham steaks were given 1 minute in the oven. Hot fresh apple pie with melted cheese came out of the oven in 10 seconds." "The housewife of 1952 will be able to stick a raw steak on a dinner plate, slide it in an oven that isn't hot and serve it, cooked and simmering, 30 seconds later. And, in that not too distant golden age, there will be no need for potholders, tin pans and aprons. The food gets very hot but the plates stay cool. There is no grease splattering and tin pans just won't work in the new 'Radarrange'--a radar cooker. Its manufacturers say the device is the 'only new heat application to cooking since the discovery of fire over 2,000 years ago. '...There are only a few in existence...because improvements are being made so fast that a model can be obsolete in a couple of months. These few are on lease to hotels in Boston, Washington, Cleveland and Buffalo. The company is working on models for Navy ships and Army airplanes and expects to have one ready for homes in three to five years. Newsmen here saw--and enjoyed the results--of a radar range that turns out baked stuffed lobster and broiled chicken in 2 1/2 minutes instead of 30. Diced potatoes take 25 seconds. Vegetables need no water and corn-on-the-cob needs only 40 seconds. The not-quite obsolete model now is aobut the size of a domestic refrigerator and lined with aluminum. There's room for eight chickens inside and a clockwatch button that automatically turns off when the cooking time is up." "Radar cooking is being tested in Cornell's home economics college in a research project sponsored by the navy. The process actually is dielectric or high frequency cooking but is popularly called 'radar' cooking because it operates on the same principle. Results have been highly successful so far...The oven, all metal, has a glass window at the rear which admits high frequency waves which are circulated by revolving antennae at the top of the oven. The product cooks all at once as the high frequency waves set up friction within the molecules of the food. Oven glass or pottery containers must be used in radar cooking because metal reflects the waves, sending them away from the food. With this unusual cooking method, the oven always is cool and pot holders are not used. Pencil size holes in the oven door afford the cook an opportunity to watch progress of the food, but are so sized and spaced that the high frequency waves cannot escape. The navy has contracted with Miss Kathryn Causey, research associated of the school of nutrition, to test palatability, nutritive value, weight losses and bacterial count of ground beef, lamb and pork cooked in the radar oven, as compared with those meats cooked by usual methods. So far, she reports, there is little difference, except the radar oven doesn't brown meat...Baked goods such as bread and cake are a failure in the radar oven. They rise so quickly the baking powder doesn't have time to act. Several flour mills are working on recipes adapted to high frequency baking. Boiling eggs in a radar oven is disastrous. The eggs explode in three seconds. Miss Causey believes radar cooking must undergo many revisions before the homemaker can use it. So far the equipment is too costly. An oven rents for $5 a day and will retail at about $2,600. On to of that, timing is very important. Ten seconds over or under cooking may ruin the food." "Cook a Steak in 30 Seconds--The Raytheon Radarange uses radar magnetron tube to cook food in seconds instead of minutes, minutes instead of hours. Food retain all their flavor, taste, natural juiciness and nutrietents. Radaranges are used by the Pennsylvania Railroad and United States Lines--will be available for hotels, restaurants, lunch counters." "Mansfielders enjoyed the treat of a lifetime last week at the opening of Tom McNew's restaurant at Fourth and Walnut. The finest dinners and sandwiches were served lightning fast. McNew's has the distinction of being the first restaurant in Mansfield with radar cooking...The new restaurant is open 24 hours a day every day except Tuesday...Kosher corned beef, Virginia ham and prime ribs of beef are delicacies it is sometimes hard to find but not at Tom McNew's...McNew's restaurant is completely different for it cobines the features of a cafeteria, sandwich shop and restaurant into one big establishment...The McNew slogan 'A Meal a Minute' is a fact as you will discover..."
"Electronic heating, or microwave cooking, is only two years old, commercially speaking...It was long known by little used induction heating....In 1953 Raytheon's engineers had adapted the electronic force that made radar to a range that will cut hours from the housewife's cooking day. The company put out a 'radarrange' for restaurants, hotels and other commercial establishments. It sold for $2,975--a tidy sum for a stove. Last year Raytheon licensed the Tappan Stove Company to make the first domestic model. This year a license agreement was signed with the General Electric Company's Hotpoint affiliate. Prices will run from $1,000 to $1,200. This is still high, but prices should drop as mass production gets going." "Just completed at the Robson's restaurant, 440-442 Main St. is the installation of the latest method of cooking equipment under the direction of H.E. 'T' Robson, owner and operator of the popular eating establishment. Much of the cooking now at the local restaurant is being done in a radar range...Every safety precaution has been taken by the manufactuer [Raytheon] so that users of the equipment are in no danger from contact with the potent waves. When the door of the radar stove is opened the equipment turns itself off automatically. It is the first such installation in this area of the state...Because of the newness of the readar cooking method and its radical difference in applicaton, cooks at the local restaurant have gone through a training program to acquaint them with the stove...Another innovation at the eating place was the installation of a new open hearth broiler, which will serve as a companion for the new radar range." "Talk story about the first self-service, microwave restaurant in the world- Tad's, at 18 East 42nd St. The patrons put frozen food into a tableside microwave oven. The average length of time a customer will have to wait for the food to be reconstituted is two minutes. Mr. Neal Townsend, one of the owners of the restaurant, predicted that a few years from now there'll only be two kinds of restaurants left -very expensive ones, like the Four Seasons, and microwave reastaurants, like this one, whose prices compare favorably with ordinary cafeteria prices." "A single slice of piping hot apple pie topped with a wedge of melting cheese served 15 seconds after being ordered or a complete turkey platter ready to eat less than to minutes after removal from refrigerated storage are not fantasies of the future. These are but two of many fully or partly prepared dishes that can be ready for service in less than two minutes with the aid of a microwave oven. Although microwave ovens have been manufactured for abut 15 years, their acceptance and use in homes and restaurants has been limited. This is due partly to high costs and slow realization that they are adjuncts to conventional cooking methods rather than replacements for regular ovens...Airlines have probably been the biggest users of microwave ovens, thought experiments in other food service operations have been tried. Two years ago, the Frank G. Shattuck Company, which operated Schrafft's restuarants, installed a Thermowave oven in one of its restaurants. Favorable response by employees and customers led to installation of similar ovens in five other Schrafft's restaurants. Because of its compact size (18 1/2 wide by 24 inches deep), simple plug-in electrical needs and presetting features, the Thermowave oven lends itself well to ounter operations, particularly where the kitchen is removed from the service area. The food on a service plate is placed on a turntable inside the oven, and a temperature sensing device determines when the food is fully heated. The dish can be removed with the bare hand because microwave energy passes through any insulator such as glass, paper, china and some plastics without heating them. When the oven is operating, the turntable revolves slowly to ensure even heating throughout the food. A wide selection of foods can be prepared in a central commissary for shipment, frozen or refrigerated, to an outlet with a microwave oven for "reconstitution." Schrafft's commissary supplies hamburgers, French-toasted sandwiches, beef pie and apple pie with cheese for microwave menu listings. ..Thermowave ovesn are also part of many of Schrafft's commercial fod operations both in waitress-service situations and customer-operated vending machine operations. The feeding of employes through vending machines is an increasingly popular method in small companies and especially for those companies on a 24-hour schedule. Complete dishes on dispoable paper or plastic dishes are stored in a refrigerated vending machine to be released when coins are inserted and then heated in an adjacent microwave oven. The New York State Pavilion at the World's Fair includes customer-operated Thermowave ovens near the snack counter. Manufacturers of the unit forsee the day when hospitals and other institutions will use microwave ovens to provide a greater variety of hot meals." What did the Amana Radarange look like & cookbook. General instructions for home cooks encountering their first microwave oven. "The convenience of the Radarange Microwave oven in your home. A new, better and quicker way to prepare food. The Radaragne is completely new. It has never been available for use in the home. You cook with microwaves, not conventinal dry heat. The second you open the door of the Radarange you are opening up a new, more convenient way to food preparation. It is exciting, dramatic and allows many short cuts and time savings that you never dreamed possible. Say good-bye to the old-fashioned metal pots and pans. You do not use them when cooking in the Radarange! You can cook food, in family portions if you want, on dishes made from glass, palstic, yes, even paper. Imagine, now after-meal clean up of pots and pans!...In just a short time you will be using the Radarange for most of your food preparation. It will become the center of most of your food preparation. In fact, it will help you prepare 75-80% of the foods that you serve your family." "Dr. Percy L. Spencer, retired senior vice president of the Raytheon Company...and a well-known inventor...held more than 130 patents, among them the application of microwave energy to medical diathermy, high-frequency devices and electronic tubes. He developed the special tubes that made possible the proximity fuses introduced in World War II. For this work he received the Naval Ordnance Award. Dr. Spencer was the fifth employe to joing the then infant Raytheon Company in 1925. Perhaps his first accomplishment was to help in developing the first gaseous rectifier tube that made the radio a common household plug-in applicance. An article in the 'most unforgettable character' series in the Reader's Digest in August, 1958, described Dr. Spencer as 'an orphan who never graduated from grammar school, he has demonstrated that nothing is beyond the grasp of a man who wants to know what is going on, and who feels a sense of responsibility for doing something about it.' Dr. Spencer was awarded an honorary Doctor of Science degree by the University of Massachusetts and by Nasson College in Maine. He also held an honorary degree from the University of Maine. He was a fellow of the American Academy of the Institute of Electrical and Electronics Engineers." True or false: paper cups were initially promoted for convenience by large paper manufacturers in order to boost sales. False. Paper drinking cups were promoted by 19th century public health officials to stave off diseases festering in public drinking venues. The water was generally fresh. The fountains were sometimes questionable. The public drinking cups were swarming hotbeds of communicable disesase. School children regularly shared cups that were not properly sanitized between drinks. Hospitals, military messes, railroads, hotels, soda fountains, factory cafeterias, vending machines, and picnickers quickly embraced the inexpensive sanitary disposable paper cup. In the 1920s, Congress announced they were using paper cups in their cafeterias; confirming government committiment to resolving serious sanitation issues. Hot-cold cups were introduced in the 1930s; styrofoam was available to the general public after WWII. New York City's ubiquitous blue Greek design paper coffee cups first surface in the early 1960s. "Patent folding drinking cups, 14 cents"
"The now popular on omnipresent "nickel-in-the-slot machine" has only come into practical use within the past four years...Since 1888 there have been about 4000 patents issued for these machines, which have been classed under the head of "coin-controlled apparatus," and this class has been divided into twenty-four sub-classes. About the same number of patents have been issued in England and a large number in Germany. Almost everything can now be obtained from these automatic clerks or, waiters. A person can drop a coin, either a penny or a nickel, in a slot and procure a cigar, cigarette, or piece of candy, or have his boots blacked, see a horse race, game of baseball, or get a glass of soda, lemonade, mineral water, a cup of tea, a cup of coffee..."
"It is a very dull week in the reform business that does not witness the advent of one or more new projects...One of the latest reform movements originating with the medical profession is the individual drinking cup. The agitation began in the churches, with a discussion of the dangers incident to the using of a common chalice at communion services. Already a number of churches have adopted the plan of individual chalices, and the reform is spreading. It is taking a wider range than that of religious bodies, for doctors and many others are now opposing all promiscuously used drinking cups. Numerous medical societies are discussing the subject, and in so doing are successfully exploiting the germ theory. The Homeopathic Society of Philadelphia is especially conspicuous in this movement. At a recent meeting it adopted resolutions in the Quaker City to discontinue the use of common cups in the public schools. It has also asked the railway companies to take the public drinking cups out of their cars and out of the railway stations. The Philadelphia homeopaths have in view a sweeping change--the entire abolition of the common drinking vessel and the inauguration of individual vessels. They would have the ladles removed from public pumps and hydrants in streets, hotels, steamboats, theaters, and all other places of public resort. A necessary condition of life, or, at any rate, of comfort, under this plan would be the carrying about of a drinking vessel by every person. The drinking cup would be individualized as much as the toothbrush or packet handkerchief. One of the doctors has already suggested water-proof paper cups to be kept at schools. He says they would be so cheap that they could be destroyed as soon as used. No movement of this kind can be carried into effect at once, but if, on thorough investigation, this is deemed wise and expedient, it will be generally adopted. There will be no difficulty in providing cups at insignificant cost that can be slipped into a vest pocket. There is little room for doubt that diseases are spread by the common use of drinking vessels." "A handy folding drinking cup of waterproof paper comes in a flat, folded package that fits in a vest pocket. When opened it forms a cylindrical vessel bound with wire and having a wire handle. It holds about a cupful of cold water, milk, tea or medicines. It can be used to hold hot liquids, but can only be used once, or at most twice. A cup filled with cold water stood for eight hours without injury and was then dried, refolded, and used again several times. It is useful in traveling, in camp and in the sickroom--Women's Home Companion." "Another new step in the universal fight against disease has been made in the adoption by the bureau of charities of the individual drinking cup machine, a device which does away with the old time common drinking cup, so often a means of disease communication. The bureau purposes to install the machines in the poorer quarters of the city, where cleanliness and sanitary conditions about drinking facilities are unobtainable. The danger from the drinking cup handed from hand to hand and used by scores of persons in a single day has long been recognized by physicians and health authorities throughout the country...The individual drinking cup machine guards against these evils by presenting each drinker with a brand new white paraffin paper cup. The device is automatic and may be equipped with a coin operating adjunct if desired. In some places fountains have been established where for a cent dropped in the slot one may obtain a clean cup filled to the brim with ice cold water. The machine is made of white enamel with a bottle of water inverted in the top like an ordinary cooler. The cups are manufactured by an automatic process and are not touched by the hand until they are filled, ready for use...School-children, particularly in the poor districts of large cities, have been the chief victims of disease spread by old fashioned cups, and this has resulted in the establishment of the "bubble fountain," similar to those The Tribune recently placed on the streets of Chicago, and the introduction of individual cups. In many schools each child is supplied with a paraffin cup, and this is replaced as soon as it becomes soiled." ---"Busy Inventors Who Seek to Prolong the Lives of Careless Human Beings," Chicago Daily Tribune, May 23, 1909 (p. H6) ? "To the Editor of The New York Times: At soda fountains little children drink from poorly rinsed glasses which a moment before--owing to the haste with which drinks are served at large soda fountains--may have been in the mouth of an infected man or woman. I would suggest the use of some sort of paper cup, such as are used on one or two railroads. These cups are quite inexpensive and can be thrown away once they are used. On open paraffine peper cup could be placed in the soda fountain holders quite easily as a glass. "Sanitas." New York, July 3, 1909." "The public drinking cup to-day goes out of existence all over this [New York City] city. To drink out of one which may not have been removed is a misdemeanor, an act for which an arrest can be made without a moment's notice. The new provision of the Board of health's Sanitary Code, which upsets custom, reads: 'The use of a common drinking cup or receptacle for the drinking of water in any public place or in any public institution, hotel, theatre, factory, public hall, or public school, or in any railroad station or ferry house in the City of New York or the furnishing of such common drinking cup or receptacle for use in such place is hereby prohibited...The same to take effect on and after the first day of October, 1911.'" "Children in a dozen schools have been taught during the week how to construct a paper drinking cup of which is in every way serviceable and which does away with danger of contagion through use of a common cup...The cup is constructed from a sheet of paper about eight inches square. A unique method of folding provide a cup that may be collapsed or extended at will. It can be used six or seven times at least, and some pupils have employed the same cup for a week. Any sort of tablet paper may be used, but it has been found that an oiled paper or a foolsoap with glass lasts longest." "The order late last month by Speaker Longworth closing the lunch counter at the House cloakroom on the warning of a naval surgeon that it was unsanitary has been rescinded in compliance with the demands of members. The Speaker conferred with his advisers, medical and otherwise, and it was decided that the lunch counter might be recommissioned on condition that it comply with modern rules of sanitation. Under the old order, the cloakroom dispensary used common drinking cups in supplying coffee and sandwiches were sold unwrapped. Now coffee is served in individual paper-mache cups and all sandwiches are carefuly encased in paper wrappers." "Vortex Mfg. Co. is the largest manufacturer in the world of paper drinking cups, soda cups and sundae dishes, with output in 1928 exceeding one billion cups. Vortex products are cone-shaped...The business started in 1911 with $25,000 capital...Its success has been due to able management; the invention of automatic machinery by Mr. Cesare Barbieri, the Company's consulting engineer; patent protection on machinery, processes and products, and the increasing public use of paper cups because they are sanitary and cheap. Health officials in many states are becoming increasingly active in enforcing laws and sanitary regulations pertaining to public drinking places and soda fountains. Vortex products...are in widespread use in factories, offices, stores, soda fountains, hotels, restaurants, oil filling stations, railroads, steamships, etc." "A guest list more distinguished than usually graces a formal White House dinner was represented today at a 'hot dog" luncheon given by President Roosevelt at his cottage, located two miles from the Summer White House...The guests, ranging from prominent ones to chauffeurs, found paper plates, paper cups and knives and forks and filed past the tables in line." SOURCE (includes photo of classic cup design): NY Cup Company. "Hot coffee in paper cups had been served all around..."
"Pack of 50 styrofoam cups, 7 oz for hot or cold drinks, 49 cents." "Cups and glasses: the insulated cups cost the same as paper cups, but because they are Dylite foam plastic, they hold heat far better; won't burn fingers or mark desk tops."